All of Scotland north of the Forth-Clyde line was originally inhabited by Picts, but during the post-Roman period, from the late 5th century onwards, the southwest corner of Pictland was colonized by Gaelic-speaking settlers ("Scots") from Ireland, and by the middle of the 6th century the Gaelic kingdom of Dalriada covered part of northern Ireland and the islands and coastal areas of the southwest corner of Scotland north of the Forth-Clyde line. 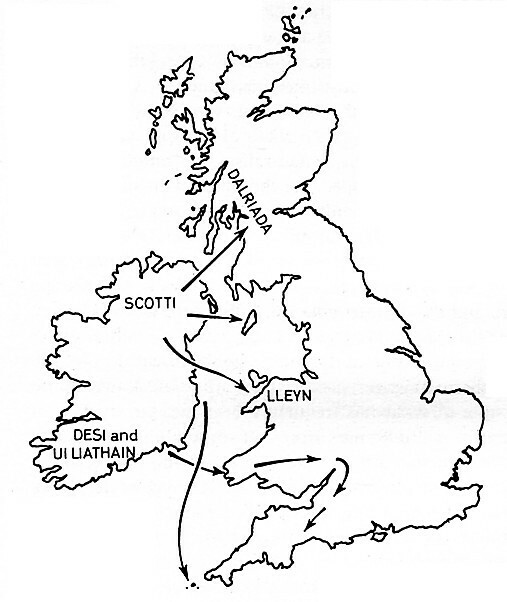 There are only three Ogham stones in the parts of Scotland corresponding to the Gaelic kingdom of Dalriada, all on or very near the coastline. Two of these are classic Ogham pillar stones with a Goidelic language Ogham inscription engraved along one of the natural edges of the stone, such as are found in Ireland : one on the island of Gigha (GIGHA/1) which has a typical "X, son of Y" formula; and one on the mainland at Poltaloch (POLCH/1) which has a single personal name. These two stones may reflect the first wave of colonization of Scotland by Gaelic speakers from Ireland during the 5th and 6th centuries. The only other Ogham stone to have been found in this area is a fragmentary block from Lochgoilhead (LOHED/1), which has a number of unusual features not found on classic Ogham pillar stones: the stone has the remains of both an Ogham inscription and a Latin inscription (only one of two such stones in Scotland); and the Ogham inscription is engraved on an artificial stemline on the surface of the stone rather than along the edge of the stone. 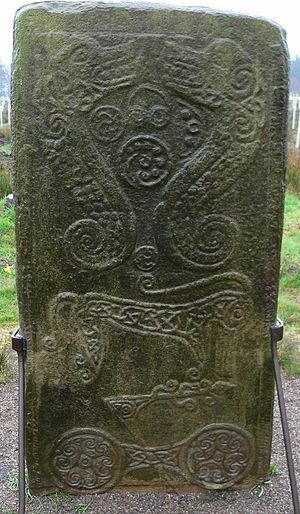 As the name represented by the Ogham inscription has been interpreted as being Goidelic, and there are no Pictish-style decoration on the stone, it is probably also a product of Gaelic settlers in the area, although the Latin inscription suggests a later date than the two Ogham pillar stone, perhaps the 7th or 8th century. In addition to these three Ogham-inscribed stones, a number of Ogham inscriptions have been identified on natural rock surfaces. One, only 4 km from the Ogham stone at Poltaloch, is on a rock outcrop at the top of the hill fort at Dunadd (DUNAD/1), which has been identified as the seat of the kingdom of Dalriada. The inscription is incomplete, but part of a Gaelic name has been identified. 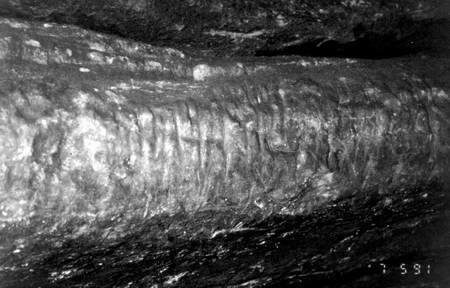 Three other Ogham inscriptions are to be found on the walls of the Blackwaterfoot Cave on the Isle of Arran (BLFOO/1, BLFOO/2, BLFOO/3). These rock inscriptions are highly unusual, and are the only examples in Great Britain besides an unconfirmed Ogham inscription in a cave in Fife (WEMYS/1). The majority of Scottish Ogham stones are located in areas which were under the control of Pictish kingdoms, along the eastern coast of Scotland north of the River Forth, and in the Orkney and Shetland islands. All of the stones along the east coast of Scotland are in low-lying areas on or near the coastline, with the largest concentration of stones in mainland Scotland in the area inland from Aberdeen. 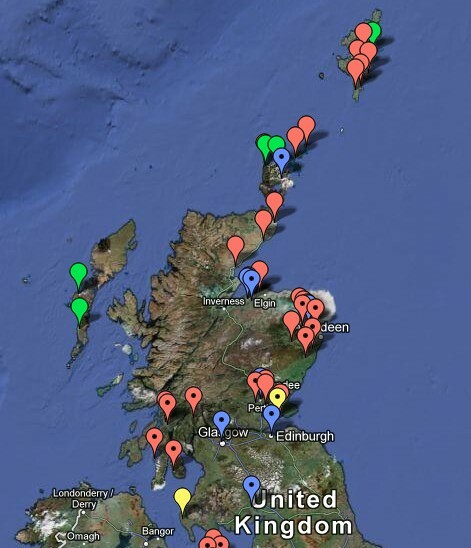 There are no known Ogham stones from the highlands or the Outer Hebrides, although a number of portable artefacts with Ogham inscriptions have been found in the Outer Hebrides, the Orkney islands, and the Shetland islands (marked with green tags on my map), suggesting that Ogham was more widely used than the distribution of monumental Ogham stones would suggest. These and other Ogham-inscribed portable artefacts will be discussed in a future blog post. 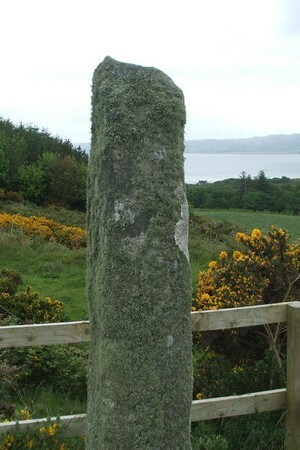 There are a couple of Ogham stones in the east of Scotland which are pillar-shaped and have an inscription running up one of the natural edges of the stone (AUQUH/1 and NEWT/1), but these differ from the pillar stones of Dalriada in that the inscriptions on them seem to represent Pictish personal names rather than Gaelic personal names. The majority of Ogham inscriptions from the Pictish areas of Scotland are very different to those found in Ireland and elsewhere in Britain. 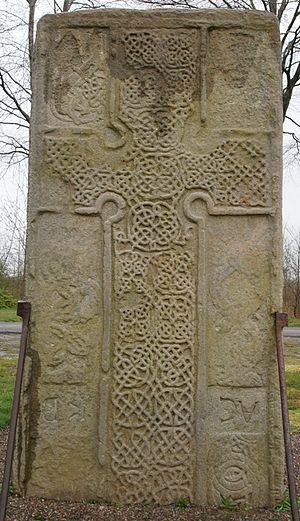 Firstly, the inscriptions mostly occur on Pictish symbol stones or cross slabs where the Ogham inscription is just part of a larger design that includes Pictish symbols and images and/or intricately interlaced cross designs. Secondly, the Ogham inscription is usually engraved on an artificial stemline on the surface of the stone, either on the main surface of the stone (e.g. FRMSN/1 and BRATT/1) or running up one or both of the narrow sides of the stone (e.g. DYCE/1 and FORDN/1). In some cases the inscription does not have an artificial stemline when it runs along the sculptured edge of a monument (e.g. GOLPI/1). The most intriguing feature of the Ogham inscriptions from the east of Scotland and the Orkney and Shetland islands is their language, which has been subject to much discussion, as well as some fanciful suggestions which I shall not repeat here. The identification of the language of these inscriptions has been hindered by the peculiar orthography employed, with frequent doubling or even trippling of letters, but the general view is that the language of these stones is mainly Pictish, and that Pictish is related to the Brythonic languages spoken in Southern Britain. Unfortunately, Pictish is so poorly attested that it is difficult to be certain what the Ogham inscriptions mean, although by analogy with Ogham stones from elsewhere it is thought that the inscriptions largely represent personal names. Although the names on these inscriptions mostly seem to be Brythonic, i.e. Pictish, several of the inscriptions include the Goidelic element MEQQ" (BREAY/1, STNIN/1) or MAQQ (ALTYR/1, DYCE/1, FRMSN/1, LARON/1) which presumably corresponds to the Primitive Irish word maqi "son of" commonly found on Ogham pillar stone from Ireland and Wales. MEQQ or MAQQ in these inscriptions may be a Gaelic loanword in Pictish, or it may indicate that at least some of these inscriptions were written in a Gaelic language, and that only the personal names were Pictish. I tend to favour the latter hypothesis as it seems unlikely that the Picts would need to borrow such a common word as "son" from their Gaelic-speaking neighbours (it has been argued unconvincingly that Pictish had no word for "son of a father" as it was a strictly matrilinear society, but in that case why would they need to use such a word in monumental inscriptions?). There have also been some attempts to read Old Norse names and words in some of the inscriptions, particularly those from the Orkney and Shetland Islands, which were subject to Scandinavian colonization during the late 8th and early 9th centuries. The most convincing example occurs on a decorated cross slab from Bressay in Shetland (BREAY/1) which has the inscription "CRROSCC NAHHTVVDDADDS DATTRR ANN[--] | BENISES MEQQ DDROANN[--]" (The cross of Nahhtvddadds, daughter of Ann[...], and Benises, son of Droann). Katherine Forsyth regards the language of this inscription as mixed Norse-Gaelic, with the red-coloured names and words being Old Norse, and the green-coloured names and words being Goidelic. In particular, she identifies the word DATTR as Old Norse dóttir "daughter"; but although the Goidelic word inigena "daughter" only occurs a single time in the entire Ogham corpus (EGLWC/1) it seems somewhat unnecessary to have to borrow the Old Norse word for daughter when writing Ogham. It is very hard to accurately date Ogham stones as they are normally surface features with no archaeological context, and in many cases have been moved from their original site. 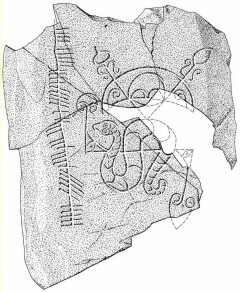 A very few Ogham stones have been found in association with an inhumation burial (INCHY/1, POLCH/1), and the associated burial could have provided valuable dating evidence for the dating of the Ogham inscription if systematic archaeological investigation had been carried out at the time of discovery. In recent years, two slate stones engraved with a stemline Ogham inscription have been unearthed outside of Scotland, and these could be invaluable in anchoring the date of Type II inscriptions on archaeological grounds. In September 2006 a slate stone with a Type IIb inscription was found on the Isle of Man during an archaeological dig for the British archaeology TV programme Time Team (SANTN/2). This stone was found in association with a burial that was radiocarbon dated to AD 540–650, but as Katherine Forsyth dated the inscription to the 10th or 11th century (potentially 8th to 12th century) on epigraphic and linguistic grounds, the Time Team archaeologists discounted any association between the stone and the grave by which it was found. This was a serious error in my opinion, as the linguistic evidence was based on a misreading of the inscription, and there is not enough evidence to date an Ogham inscription on epigraphic grounds. In fact, it is precisely because the dating evidence for epigraphic features of Ogham inscription is uncertain that we need to look to archaeology for support, and throwing out archaeological dating evidence because it does not fit the preconceived dates is just wrong. The Isle of Man is far away from the Pictish areas of Scotland, and the inscription on this stone do not exhibit any of the distinctive epigraphic features of Pictish Ogham inscriptions such as angled consonants and supplementary letters, so there is no need to assume that the Isle of Man inscription dates to the same late period as many of the Pictish Ogham inscriptions. 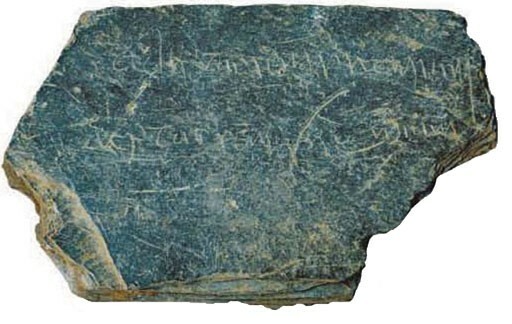 In November 2009 a slate fragment with a Type IIa inscription was found in a ploughed field on the Penwith peninsula in Cornwall (PAUL/1), but despite being immediately reported to the Portable Antiquities Scheme and having been verified as an Ogham inscription by Professor Charles Thomas and Dr Katherine Forsyth (who has described the stone as a "really significant find"), no attempt has been made to investigate its archaeological context or find any other fragments of the inscription (the piece found had a freshly broken edge across the inscription), and it is not even included in the PAS database. Despite the shameful neglect of this important stone by archaeologists, it is an extremely important piece of evidence that stemline inscriptions were not restricted to Scotland. From the Isle of Man and Penwith Ogham inscriptions it is possible to hypothesise that stemline Ogham inscriptions and bind Oghams developed outside of Scotland during the 6th and 7th centuries, but they are poorly represented as they were not used on monumental pillar stones, and that stemline Ogham inscriptions were introduced into the Pictish area during the 7th or 8th centuries, where they developed a number of peculiar epigraphic features not seen on Ogham inscriptions from elsewhere. In some inscriptions the H-series and B-series of letters are made up of lines that are at an acute angle with respect to the stemline (as opposed to a right angle, as is the case with Type I inscriptions). This is more commonly a feature of Type IIb inscriptions (e.g. BURIN/1), but may also be found in some Type IIa inscriptions (e.g. BREAY/1). In the case of Type IIa inscriptions, in some cases only some letters are angled, or angling only appears to be applied to the H-series letters or the B-series letters. The direction of the angling indicates the reading direction of the inscription, with the lines trailing back towards the start of the inscription. This feature is not found in any of the Type II inscriptions from outside of the Pictish area of Scotland or in the manuscript tradition, and so it may be a local innovation. It is likely that inscriptions that exhibit this feature are later in date than inscriptions without consonant angling. In some inscriptions the vowel letters are chevron-shaped rather than straight lines crossing the stemline perpendicularly. The direction of the angling indicates the reading direction of the inscription, with the lines trailing back towards the start of the inscription. This is more commonly a feature of Type IIb inscriptions (e.g. DYCE/1, LTING/1), but is rarely found on Type IIa inscriptions (e.g. a bone plaque found at Bornais in South Uist). In the Type IIb inscriptions BIRSY/3 and CBURG/1 the strokes of the vowel letters are chevron-shaped but are not bound at the tips as the other letters are. In many inscriptions angled vowel letters occur together with straight vowel letters (e.g. BREAY/1 and LTING/1), and it is not clear whether the angling is merely stylistic or whether there is a phonetic difference between angled and straight vowels. In some inscriptions the length of the lines making up the H-series and B-series of letters increases (or less commonly decreases) in the direction of reading (e.g. ABNTY/1, BIRSY/3). In two inscriptions found in the Shetland Islands (BREAY/1 and LTING/1), a double dot mark is used as a word separator mark. Word separator marks are not found on any other Ogham stone inscriptions from Scotland or elsewhere. The double-dot mark is identical to the Runic double-dot word separator mark (᛬) used in Old Norse Runic inscriptions such as the mixed Ogham and Runic inscriptions on the Isle of Man (e.g. 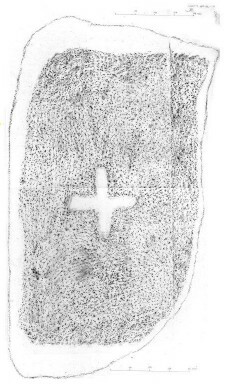 MAUGH/2), and the use of the double dot mark in the Shetland inscriptions is a reflection of Scandinavian colonization of the islands during the late 8th and early 9th centuries. This is a rare variant of the letter A, written as a single curved ʃ-shaped stroke crossing the stemline. This letter is found in both Type IIa inscriptions (e.g. LARON/1) and Type IIb inscriptions (e.g. DYCE/1, LTING/1). In the Auraicept na n-Éces similar ʃ-shaped strokes are used for the M-series of letters, but from context it is clear that the ʃ-shaped stroke in these inscriptions must be a vowel, and as in two out of three cases (LARON/1 and DYCE/1) the letter occurs between M and QQ, it would seem to be used to represent the a of maqq "son". However, it is uncertain whether this letter represents a special phonetic value or whether it is simply a stylistic variant intended to make the letter more distinctive. This is a very rare variant of the letter D, written with the two strokes curving away in opposite directions like a pair of rabbit ears. The letter is only attested in the Type IIa inscription BREAY/1 where a pair of rabbit-eared Ds are used contrastively with a pair of ordinary Ds. In the Type IIb inscription DYCE/1 a pair of Ds is written with each letter curving away from the other letter so that both letters together look like a single pair of rabbit ears (this contrasts with a pair of parallel Ds elsewhere in the same inscription). As the two strokes of a single letter D could not curve away from each other when written as bind Oghams, it is quite likely that the rabbit-eared double D of DYCE/1 is the bind Ogham equivalent of the pair of rabbit-eared Ds of BREAY/1. It has been conjectured by Forsyth and others that the rabbit-eared D (or pair of such letters) represents a voiced dental fricative [ð], in contrast with the [d] of the standard letter D (or pair of such letters). Two inscriptions, one in Orkney (BURIN/1) and one in Shetland (BREAY/1), have an unusual letter made up of five diagonal strokes in one direction overlaid by five diagonal strokes in the other direction. This crosshatched letterform does occur in the Auraicept na n-Éces, but only as part of a stylistic variant of the Ogham alphabet created by writing each letter with double overlaid strokes. The crosshatched letter that occurs in inscriptions is thought to represent a double R, but whether it has a different phonetic value than an ordinary sequential double R is not known. Book of Ballymote folio 170r : "Interwoven thread Ogham"
In BREAY/1 there occurs a unique letter made of five backwards slanting diagonal slopes (i.e. slanting in the opposite direction to an Ogham letter R). From its context it is thought to represent a letter I. 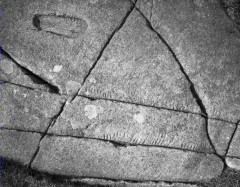 A diamond-shaped letter O occurs in two Scottish Ogham inscriptions (FRMSN/1 and BREAY/1), and in only a single inscription outside Scotland (KLGRO/1). This is the same as the supplementary letter Ór ᚖ that is found in the manuscript tradition to represent the diphthong oi (see detail from Book of Ballymote folio 169v shown above). It is not certain what phonetic difference compared with the ordinary letter O this letter represents. An X-shaped letter is quite common in Scottish Ogham inscriptions. This is the same as the supplementary letter Éabhadh ᚕ that is found in the manuscript tradition to represent the diphthong ea (see detail from Book of Ballymote folio 169v shown above). However, in the inscriptional tradition it is used to represent either the consonant K or the vowel E. As a consonant it is almost exclusively used in the deictic particle koi ᚕᚑᚔ (which corresponds semantically to the Latin phrase hic iacit "here lies"), which is found nine times in Irish Ogham inscriptions (BUKIL/1, COLIN/4, LEGAN/1, BALBO/1, DNARD/1, BAHAN/2, MONAT/3, BLTAG/2, BLTAG/9). It may rarely be found as a consonant in other words, as in COOLM/1 (County Kerry, Ireland), where it is used to spell the clan name TOICAKI ᚈᚑᚔᚉᚐᚕᚔ, which contrasts with COOLM/2 and COOLM/4 where the same name is spelled TOICACI ᚈᚑᚔᚉᚐᚉᚔ. In a number of other Irish Ogham inscriptions (COOGH/1, COOLH/1, CLCAH/1, COOLM/5, KLGRO/1, KMKDR/3, LETWE/1, PRKLA/1, TINAH/2) the X-shaped letter is taken to correspond the vowel E (because, for example, it occurs between two consonants where K would not be expected), although the exact phonetic difference between the ordinary letter E and the X-shaped letter E is unknown. These inscriptions have linguistic features that are indicative of a relatively late date, such as the use of the formulaic word ANM "name" in six of them, which suggests that the vocalic use of the X-shaped letter is a later development in the history of the Ogham script, and that inscriptions with a vocalic X (E) postdate this with a consonantal X (K). In the Scottish Ogham inscriptions the X-shaped letter is found on BURIN/1, DYCE/1, FRMSN/1, GOLPI/1, LTING/1, MAINS/1, NEWT/1, as well as on the Bornais Bone Plaque. In four of these inscriptions (GOLPI/1, FRMSN/1, LTING/1, MAINS/1), from context it is clear that the letter acts as a vowel. In the case of DYCE/1 the X-shaped letter occurs before a letter O, so could be an E or a K, but as DYCE/1 is epigraphically similar to LTING/1 it is more likely to be intended as an E. In the case of the NETW/1 inscription, which has features indicative of an earlier date than the other Pictish Ogham inscriptions (the inscription is carved along the edge of a stone pilar, with no artificial stemline), the X-shaped letter occurs between two vowel letters, and so is unlikely to be a vowel as well, but has been interpreted as either a K in Goidelic koi "here" or a P in Pictish ipo = ipe "nephew" (the letter P ᚘ is written as an X below the stemline in Ogham inscriptions). BURIN/1 is the most problematic inscription, as it has two occurences of the letter: one shaped like an X, which has been interpretted as a K or P because it occurs immediately in front of an ordinary letter E; and one shaped like > <, which has been interpretted as an E in the word CERROCCS "cross" (as a borrowing from Latin crux), although the 'E' is unexpected here, and on other inscriptions the word is spelt "CRROSCC" (BREAY/1) or "CROSQC". As BURIN/1 has features indicative of a late date (artificial stemline, bind letters, hammerhead A, crosshatched double R), it seems likely that the X-shaped letter would act as a vowel rather than a consonant, and as the two X-shaped letters in this inscription are written differently, I think that the X-shaped letter is intended to be the letter P, and the > <-shaped letter is intended to be the letter É. A disjoined X-shaped letter (either shaped like ") (" or "> <") representing É is also found on the Irish inscription CLCAH/1 and on the Scottish inscription LTING/1, so it may be that the original X-shaped letter É evolved into a disjoined > < shape in order to distinguish it from the letter P which in later inscriptions came to be written as an X on the stemline rather than below the stemline. The supplementary letter Ifín ᚘ that is found in the manuscript tradition to represent the diphthong io (see detail from Book of Ballymote folio 169v shown above) earlier represented the letter P (not used in Old Irish), and is found in a few Ogham inscriptions as an X-shaped letter written below the stemline to represent P in Latin and Pictish words (COOLE/1 and WHFLD/2 in Ireland; CRCKH/1 and KENFG/1 in Wales; PAUL/1 in Cornwall). There are two Scottish inscriptions that may use the X-shaped letter P, NEWT/1 and BURIN/1, but, as discussed above, in both cases it is not certain whether the letter in question represents a P or a K/É. The LTING/1 inscription includes an unidentified letter written as a semicircle below the stemline. There is a small semicircle line faintly engraved inside the semicircle, but Forsyth suggests this may be an "initial guide-stroke lightly incised" rather than part of the letter. As the letter occurs between two consonants it has been taken to represent a vowel, but it is not clear what vowel it should represent. It is possible that it is the epigraphic equivalent of the supplementary letter Uilleann ᚗ that is found in the manuscript tradition to represent the diphthong ui (see detail from Book of Ballymote folio 169v shown above). The letter most frequently occurs before the letter T, particularly in words that appear to be forms of the common Pictish name Nechtan. It is likely that the letter H in Pictish inscriptions represents a voiceless palatal fricative [ç] or a voiceless velar fricative [x]. The following table summarises the various unusual Ogham letters found in Pictish Ogham inscriptions, and how they are represented in Unicode on this page. Some of them may be candidates for encoding in Unicode or for defining as Unicode Standardized Variants. ᚐ Hammerhead A Treated as a glyph variant of U+1690, and displayed on this page using the BabelStone Ogham Pictish Bold font*. ᚐ S-Shaped A Treated as a glyph variant of U+1690, and displayed on this page using the BabelStone Ogham Special font*. ᚐ Angled A Treated as glyph variants of U+1690 through U+1694, and displayed on this page using the BabelStone Ogham Pictish Italic font*. ᚔ Diagonal I Treated as a glyph variant of U+1694, and displayed on this page using the BabelStone Ogham Special font*. ᚇ Rabbit-eared D Treated as a glyph variant of U+1687, and displayed on this page using the BabelStone Ogham Special font*. ᚕ Disjoined X Treated as a glyph variant of U+1695, and displayed on this page using the BabelStone Ogham Special font*. ᚗ Semicircular U Treated as a glyph variant of U+1697, and displayed on this page using the BabelStone Ogham Special font*. ᚘ X-shaped P Treated as a glyph variant of U+1698, and displayed on this page using the BabelStone Ogham Pictish font*. ᚏ‍ᚏ Crosshatched Double R Treated as a ligature of U+168F and U+168F, and displayed on this page using the BabelStone Ogham Pictish font*. ᛬ Double Dot Punctuation Treated as the Runic multiple punctuation mark (U+16EC), which has the script property of 'common', and displayed on this page using the BabelStone Ogham Pictish font*. * The 12 BabelStone Ogham fonts provide a variety of different styles of Ogham lettering (stemline and stemless, bound and unbound, straight strokes and angled strokes), and web font (WOFF) versions should be automatically downloaded and applied to this page. If you want to install these fonts on your local system they may be downloaded for free here. NB The Crosshatched Double R ligature may not display correctly on some browsers, and even on those browsers that do support it, it may only be displayed correctly if the BabelStone Ogham Pictish font is installed on your computer (i.e. not using the automatically downloaded web font). History Said to have been found during ploughing at Lochnaw in the 1960s or 1970s. At some later date it was donated to the Observatory Museum in Dumfries. Description Irregular pillar stone with an Ogham inscription on an artificial stemline running up one side. 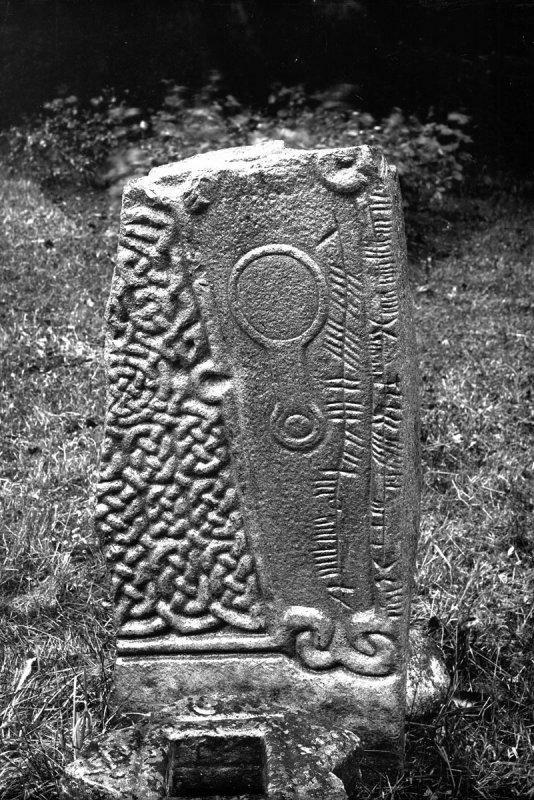 Dimensions 0.54 × 0.39 × 0.41 m.
Notes Forsyth is unable to make any sense of the supposed Ogham inscription, and it may be a forgery, especially as no other Ogham inscriptions have been found in Scotland south of the Forth-Clyde line. Current Location In situ, on the left-hand wall of the cave, about 9 m from the entrance. History Ogham inscription first recognised in about 1968. Description Inscription engraved on a vertically oriented fissure on the cave wall. Notes The inscription is probably incomplete at both ends, and the surviving letters MEQ probably correspond to Old Irish MAQI "son of". Current Location In situ, on the left-hand wall of the cave, about 11 m from the entrance. History Ogham inscription first recognised in 1992. Description Inscription engraved on a vertically oriented artificial stemline on the cave wall. Notes Forsyth reads the inscription as a Brythonic personal name, Vuedla. Current Location In situ, on the left-hand wall of the cave, left of BLFOO/1. History Ogham inscription first recognised in 2001. Notes The inscription comprises a few Ogham letter strokes across a natural fissure, but no definite reading can be made out. 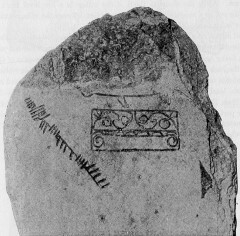 History Ogham inscription recognised in 1953. In 1978 the carved part of the rock ledge was covered by a protective fibreglass facsimile of the rock surface. Description Natural rock outcrop forming a ledge near the summit of the Dunadd Hill Fort on which are various carvings, including several footprints and a boar. Two Ogham inscriptions are carved next to two parallel fissures on the north side of the rock ledge. Notes Dunadd was an Iron Age hillfort, and later the seat of the Gaelic kingdom of Dalriada. The Ogham inscription has no natural or artificial stemline and is badly weathered, so cannot be easily read. Jackson regards the language of the inscription as Pictish, whereas Forsyth regards it as Gaelic, and recognises the Gaelic name "Finn". Current Location In situ, 90 m northwest of Kilchattan church. History Known since the 17th century; knocked down and top section lost in 1845; knocked down again in about 1864, and re-erected at current location, close to its original site. The Ogham inscription was first recognised in 1899. Description Four-sided pillar stone with an Ogham inscription running up one edge. Dimensions 1.70 × 0.25 × 0.31 m.
Notes This is a classic Ogham stone, with the typical "X, son of Y" inscription engraved down the stone's edge in classic style Ogham letters (no stemline, dot vowels). However, the inscription is weathered, as well as being damaged in four places, which makes it very hard to read. History Found in the metal-working area near the ruins of the 12th-century church, during excavations in 2000–2004. 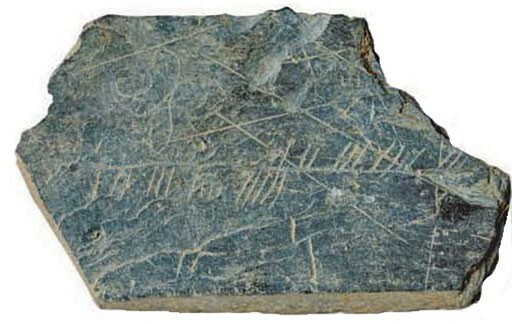 Description Small, irregular-shaped slate slab with two lines Latin text on one side, and a cross design and a line of Ogham text on the other side. Dimensions circa 0.07 × 0.03 m.
Notes The Latin inscription, adeptus sanctum praemium ("having reached the holy reward"), is a line of verse from a hymn recorded in the Antiphonary of Bangor. The Ogham inscription is the first ten letters of the Ogham alphabet. This is not a memorial stone, but was probably used for writing practice by novices at the monastic school. Lowe, C. E. (ed.). Inchmarnock: an Early Historic Island Monastery and its archaeological landscape. Edinburgh: Society of Antiquaries of Scotland 2008. Notes The first ten letters of the Ogham alphabet, carved on an artificial stemline. Current Location Inside Lochgoilhead And Kilmorich parish church. History Discovered inside the parish church in 1990; previous history unknown. Description Rectangular sandstone block with a Latin inscription in two lines parallel to the edge on one side, and a Latin inscription in one line and an Ogham inscription on an artificial stemline, both running parallel to the edge, on the other side. Dimensions 0.42 × 0.16 × 0.11 m.
Notes The Latin inscription on one side consists of the remnants of the first 13 letters of the alphabet. The Latin inscription on the other side is illegible. The Ogham inscription cannot be read with confidence, but Forsyth suggests it may represent the Irish personal name Mod-Magli or Mu-Dali. Current Location National Museum of Scotland [HPO 470]. History Discovered in 1931 near to four long-cist burials that had been excavated in 1928; it is assumed to have broken off one of the cist stones during excavation. Description Fragment of a sandstone pillar stone, with an Ogham inscription along one edge. Dimensions 2.54 × 0.82 × 0.57 m.
Current Location National Museum of Scotland [IB 110]. History Found in the old churchyard at Scoonie in the early or mid 19th century; moved to the church at Leven. Donated to the National Museum of Antiquities of Scotland in 1866. 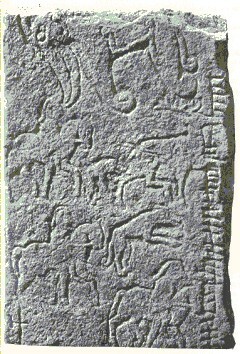 Description Sandstone cross slab, with a very worn cross on the front and a Pictish-style elephant and hunting scene on the back. An Ogham inscription on an artificial stemline in engraved on the back, parallel to the right edge. The stemline of the Ogham inscription is interrupted by the feet and head of one of the stags (leaving a gap before the final letter), indicating that the Ogham was engraved after the hunting scene was engraved. The top and bottom of the stone are missing. Dimensions 1.06 × 0.7 × 0.1 m.
Notes The Ogham inscription represents a Brythonic personal name. Current Location In situ, carved into the upper ledges at the back of the cave. Description Horizontal Ogham inscription on the wall of a cave. 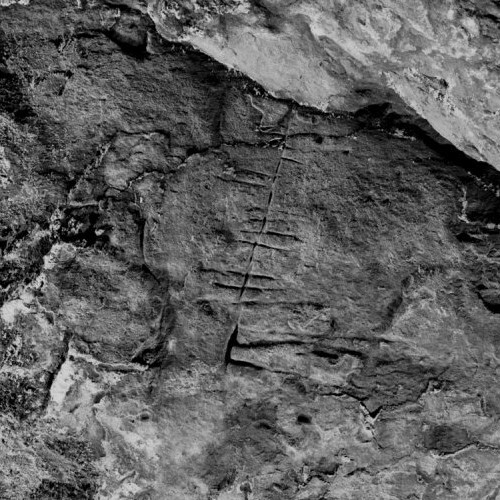 Notes This inscription does not seem to have been examined by experts yet, and as the inscription is not clear on the available photographs it is not possible to confirm whether this is a genuine Ogham inscription or not. History Discoverd in 1890 in the old churchyard. Donated to the National Museum of Antiquities of Scotland in 1892. Description Fragment of a sandstone slab, with two horse legs above a raised band within which an Ogham inscription on an artificial stemline is engraved. Dimensions 0.36 × 0.23 × 0.07 m.
Notes Ogham inscription is written with bind oghams. History Discoverd 29 January 1895 in the old churchyard, north of the foundation wall of the Church, about 1.4 m below the surface amongst the foundations of the old church, by the sexton when digging a grave. The discovery was witnessed by Mr. Marr, who was the discoverer of ABNTY/1 in 1890. 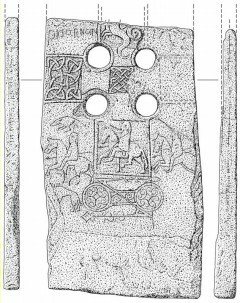 Description Slab with Pictish symbols (including a crown and a bird) and an Ogham inscription engraved on an artificial stemline on the surface. Dimensions 0.48 × 0.33 × 0.10 m.
The discovery of the stone was reported in The Scotsman (30 January 1895) by the Rev. Dugald Butler, and the stone sent to the Museum of Antiquities in Edinburgh for examination. The Earl of Southesk wrote an article discussing the find in April 1895. He points out the following suspicious features: the Ogham stemline is straight as a rule; the Ogham letters are mostly vowels, and make no sense; the Ogham letters include semicircular forms not found in other Ogham inscriptions; the symbols do not resemble the designs on other Pictish symbol stones; some of the lines are only lightly scratched on the surface of the stone, and are white as if newly made; and there is moss growing on the edge of the stone. He suggests that the stone is most likely to be a modern forgery, but he does not discount the possibility that it was a medieval production, influenced by manuscript Ogham, that was found and discarded when the old church was demolished in 1801. Earl of Southesk, "An ogam inscription at Abernethy, 1895"; Proceedings of the Society of Antiquaries of Scotland vol. 29 (1895) pp. 244–251. History The cross was first recorded in 1769. The cross originally stood 750 m southwest of Dupplin Castle, but in 1998 it was moved to the National Museum of Scotland in Edinburgh, and in 2002 it was moved to St. Serf's Church in Dunning. 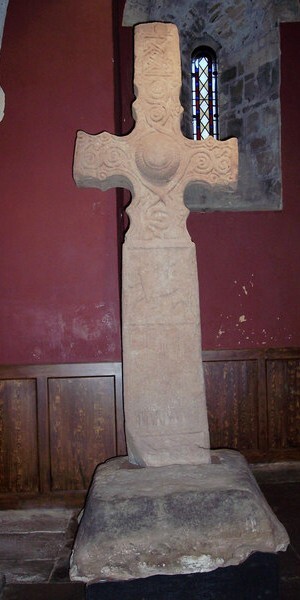 Description Sandstone cross, intricately decorated throughout, with a Latin inscription on the top of the shaft on the west face. Dimensions 2.62 × 0.94 × 0.33 m.
Forsyth has suggested that there are Ogham inscriptions on the rectangular base into which the cross is inserted, but she has not provided any readings for them. Lane and Campbell note that Forsyth's "identification is more doubtful now that the cross is in a museum setting and the base is fully visible". Katherine Forsyth, "The Inscriptions on the Duplin Cross"; in C. Bourke (ed. ), From the Isles of the North: Medieval Art in Ireland and Britain (Belfast, 1995) pages 237–244. Alan Lane and Ewan Campbell, Dunadd: An early Dalriadic capital (Oxford, 2000) page 267. History Found in 1945 whilst ploughing 100 m south of Inchyra House, in the Carse of Gowrie. Donated to Perth Museum in 1945. Description Rectangular sandstone slab with Pictish symbols carved on both faces. There are four Ogham inscriptions on one face and one end. 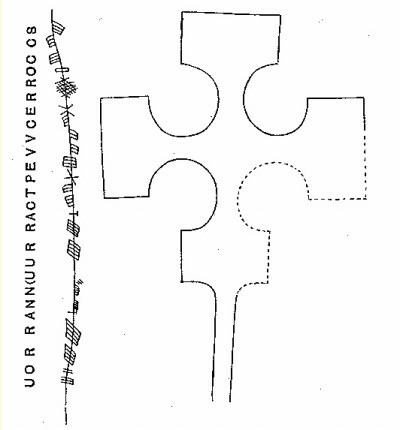 Dimensions 1.6 × 0.31 × 0.43 m.
Notes The stone slab was found covering a grave. There is one main Ogham inscription (A), clearly engraved on an artificial stemline that starts half way along one of the long sides and bends around the short end. Additionally, there are two lightly scratched Ogham inscriptions on either long side (B and C), which are harder to read, and one short Ogham inscription (D) of a few letters with no stemline on the wide end of the "rough" side. None of the inscriptions have been interpreted, and it has been suggested that the two lightly scratched inscriptions may be trial inscriptions or even graffiti. The start of the main inscription, "INEHHETES", is reminiscent of "NEHTETRI" of ACKGL/1, "NEHHTV" of FRMSN/1, and "NEHHTON[N]" of LTING/1, and may represent a Pictish name. Current Location In situ, by the side of a path 380 m. northwest of Nether Auquhollie farmhouse..
History Purportedly part of a stone circle near a croft called "Langstanes" that was cleared circa 1865 (but no sign of the stone circle remains). The Ogham inscription was first recognised in 1886. 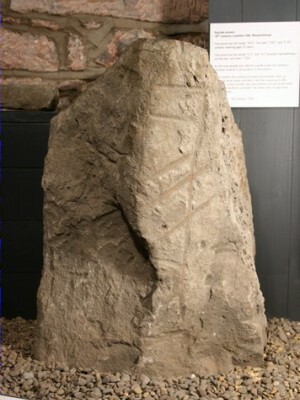 Description Pillar stone with a rectangular Pictish symbol on the northeast side, and an Ogham inscription along the southeast edge. Dimensions 0.43 × 0.66 × 0.7 m.
Notes The Ogham inscription probably represents two personal names. The stone was subject to high resolution scanning by Archaeoptics in 2005 (?). History First recognised as an engraved stone in 1891; at some time it was broken up for use in a field dyke, but was later put back together. Description Pictish symbol stone with an Ogham inscription on an artificial stemline running parallel to the left edge of the stone. Dimensions 1.07 × 1.27 × 0.91 m.
Current Location West end of the chapel. History Originally built into the wall of the churchyard; then moved to the inside of the church, where it was set into the wall. The Ogham inscription on the side of the stone was only identified after it had been removed from the wall for conservation some time between 1996 and 2004. 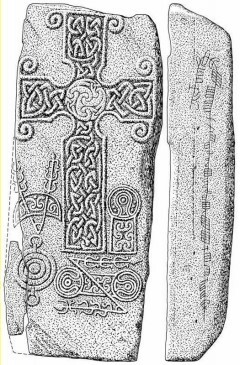 Description Cross slab with Pictish symbols on the front and an Ogham inscription on an artificial stemline, running up the right side of the stone, then bending round and running down to the left. Dimensions 1.40 × 0.60 m.
Notes Ogham inscription is written with bind oghams, and comprises probably two personal names followed by maqq "son of" and the Gaelic name Rodad. Current Location In the vestibule of Fordoun parish church. History Found at the base of the pulpit when rebuilding the church in 1788; moved to the adjacent Chapel of St. Palladius; moved to the vestibule of the church in 1966. Description Sandstone cross slab engraved with horsemen and dogs on the front face, a Latin inscription on the top left of the front face, and Ogham inscriptions on artificial stemlines running up both sides. 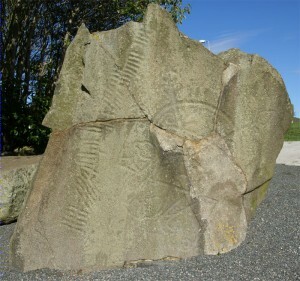 Dimensions 1.58 × 0.88 × 0.75 m.
Notes Rhys and Macalister both noted an Ogham inscription on the left side of the slab, but other authors (Allen & Anderson, Okasha, Forsyth) were unable to see any Ogham inscription on the stone. 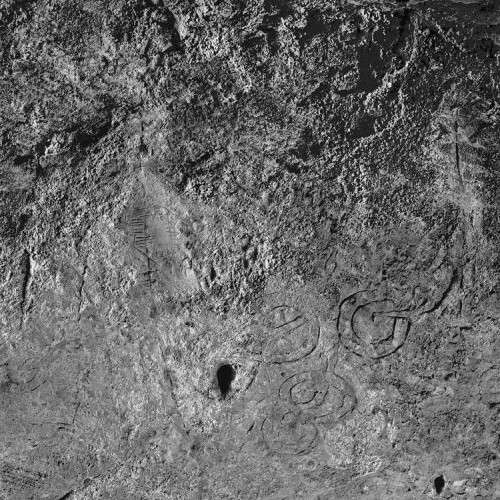 However, high resolution scanning of the stone by Archaeoptics in 2005 (?) seems to have confirmed the presence of Ogham inscriptions on both sides of the stone. Current Location Victory Hall, Aboyne. History Found under the doorstep of the old church at Formaston some time prior to 1874; moved to Aboyne Castle by 1883; moved to Carnegie Library in Inverurie in 1974; moved to Victory Hall, Aboyne in 2002. 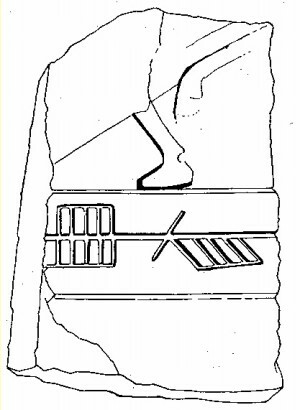 Description Lower right fragment of a granite cross slab. Two Ogham stemlines are engraved parallel to the right edge, both reading bottom-to-top. Dimensions 1.12 × 0.44 × 0.12 m.
Forsyth dates the cross slab to around the late 8th or early 9th century, but the Ogham inscription was probably engraved onto the slab at a later date. The language of the inscription is Old Irish, but the two personal names, Nehht and Talorg, are Pictish. The inscription refers to the village of Kineff, which lies about 40 km southwest of Aboyne. The word robbac that precedes Kineff has been taken as a form of the Old Irish word robaith (literally 'quench', 'drown', 'submerge') that occurs in the Book of Deer as legal term of uncertain meaning relating to grants of land over a period of time (cf. robith, "a period of usucaption, apparently covering the lifetime (or possession) of ten owners" in the Dictionary of the Irish Language). On this basis, Forsyth suggests that the inscription may record the transfer of land at Kineff to the church at Formaston. Forsyth suggests that the final 'c' in the word "robbac" may have been a misreading of an insular letter t (ꞇ) in a manuscript model for the inscription text, but as Ogham 'c' (ᚉ) is just one stroke more than 't' (ᚈ) it could more likely have been a simple carving error. William F. Skene, Celtic Scotland: A History of Ancient Alban (Edinburgh, 1876) vol.1 p.211. Kenneth H. Jackson, The Gaelic Notes in the Book of Deer (Cambridge University Press, 1972) p.120. Current Location In the garden of Logie Elphinstone House. History Originally located on the Moor of Carden, to the west of Logie Elphinstone House; built into a plantation wall when the moor was planted in 1821; moved to the garden of Logie Elphinstone House by 1843. 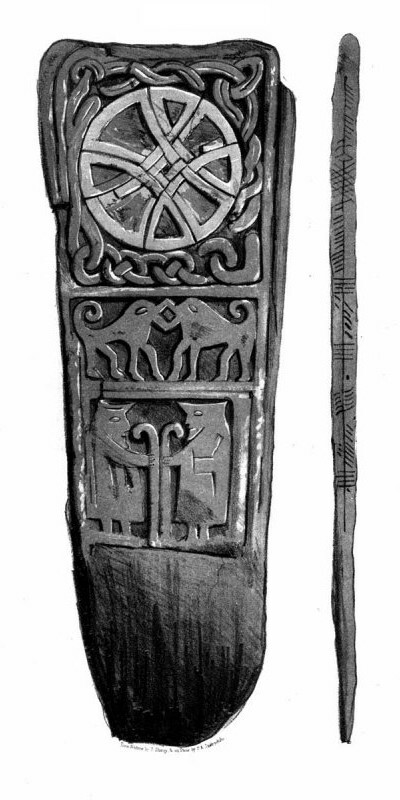 Description Pictish symbol stone with a "wheel Ogham" engraved one a single circular stem near the apex. Dimensions 1.37 × 0.76 × 0.45 m.
Notes The circular Ogham inscription does not make any obvious sense, and is probably a cypher. Forsyth reads the inscription as "Q V T Q U", but the start point and direction of the inscription are uncertain, so other readings are possible. Reading Q. V. T. Q. U. History Stone identified in 1994, lying near a cairn in a clearing in a Forestry Commission plantation. 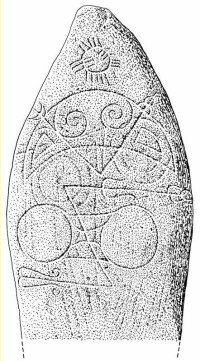 Description Granite boulder with a simple cross engraved on its upper surface, and Ogham inscriptions along the north and south edges. Dimensions 1.50 × 0.95 × 0.80 m.
Current Location East side of Newton House. History Found in 1804 in a plantation near Shevock toll-bar, on the slope of a hill above Shevock Burn, ¾ mile south of Newton House; moved to the grounds of Newton House by 1856. Description Granite pillar stone with an undeciphered alphabetic inscription in debased Roman cursive or miniscule script, comprising 46 letters in six rows, towards the top of the front face. There is an Ogham inscription running down the left edge of the stone, and an additional, shorter Ogham inscription on an artificial stemline running parallel and to the right of the main Ogham inscription. Dimensions 2.09 × 0.70 × 0.40 m.
The main inscription on the Newton Stone has been variously identified as Phoenician or Brahmi or some unknown script, but modern scholarly opinion is that it is written in debased Roman cursive or miniscule letters. No convincing reading of the main inscription has yet been made. William Bannerman reads: "ETTE | CUNANMAIN | MAOLOUOEG | UN+ROFIIS·I | H-INSSI | LOAOARUIN" Draw near to the soul of Moluag from whom came knowledge (of the faith). He was of the Island of Lorn. ( "The Newton Stone, a critical examination and translation of its main inscription"; in Proceedings of the Society (1907) pages 56–63). 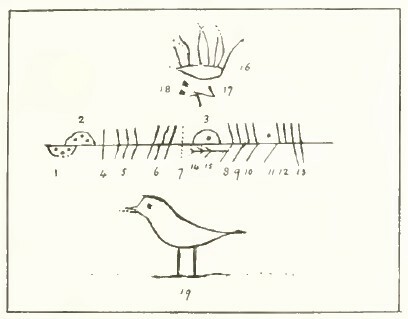 F. C. Diack reads: "ETTE | EVAGAINNIAS | CIGONOVOCANI | URAELISI | MAQQI | NOVIOGRUTA" (The Newton Stone and other Pictish Inscriptions (Paisley, 1922)). The Ogham inscription is unintelligible, but may comprise two personal names followed by either Old Irish koi ᚕᚑᚔ "here" (corresponding to Latin hic iacit) or Pictish ipe ᚔᚘᚓ "nephew" (depending upon the interpretation of the X-shaped Ogham letter), followed by a third personal name. Current Location By the drive from Altyre House to Forres (NJ 0391 5537). History Originally located somewhere in the Laich of Moray, reportedly st College Field at the village of Roseisle; moved to its current position in the grounds of Altyre House in about 1820. The Ogham inscription was not recognised until the early 20th century. Description A sandstone cross slab with an Ogham inscription running up the left edge of the front face. Dimensions 3.3 × 0.86 × 0.18 m.
Notes The Ogham inscription is severly weathered and covered in lichen. Current Location At the side of the drive of Brodie Castle (NH 98425 57665). History Discovered in 1781 in the graveyard of the old church when digging the foundations for a new church. The stone was erected in Dyke village in 1782, and named "Rodney's Stone" in comemmoration of Admiral Rodney's victory at the Battle of the Saintes. The stone was moved to the grounds of Brodie Castle, 1 km to the southwest, during the 1820s or 1830s. The stone was subject to 3D laser scanning by Deri Jones & Associates in 2010. 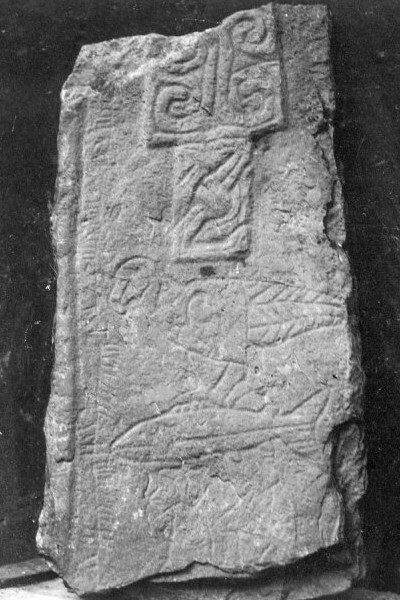 Description Sandstone cross slab with an interlaced cross on the front face, and Pictish symbols, including a pair of sea monsters and an "elephant", on the back face. A badly weathered Ogham inscription runs along three of the four edges (front right edge, rear left edge, and rear right edge). Dimensions 1.87 × 1.9 × 0.95 m.
Notes The Ogham inscription is only legible in parts, and its overall meaning is unclear. The Brythonic personal name Eddarrnonn has been identified. Current Location National Museum of Scotland [IB 168]. History Found in 1896 on the golf course at the south side of Keiss Bay. Donated to the National Museum of Antiquities of Scotland in 1897. Description Slate slab with two Pictish symbols (a spiral-filled rectangle and part of a salmon), and an Ogham inscription engraved on an artificial stemline at an oblique angle to the rectangle symbol. 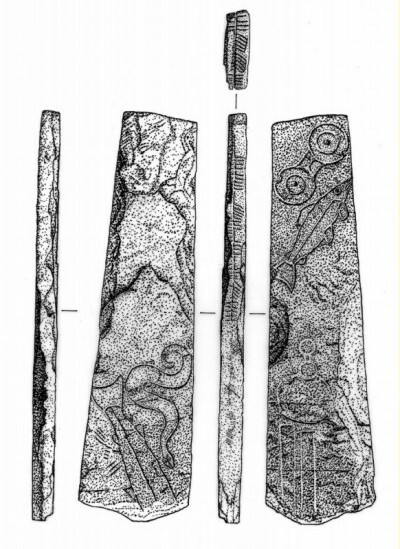 The slab was broken into several pieces when found, and was later cemented together, but part the slab is missing, resulting in the loss of most of the salmon symbol and perhaps some of the Ogham inscription. Dimensions 1.2 × 0.6 × 0.08 m.
Notes The Ogham inscription probably represents an otherwise unattested personal name. History Originally sited in the churchyard of the parish church at Golspie (earliest reference 1630); moved to Dunrobin Castle Museum in 1868. 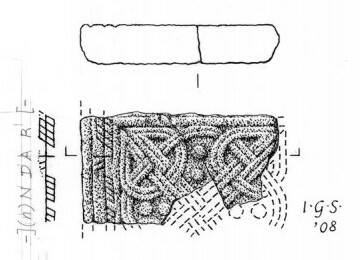 Description Sandstone cross slab with a cross with interlaced decoration on the front face, and various Pictish symbols and images on the back face. An Ogham inscription runs up the right edge and along the top edge of the back face. Dimensions 1.83 × 0.82 × 0.17 m.
Notes The inscription is Old Irish, with the words ail "rock" (extended meaning "monument") and nia "nephew" (here possibly part of a personal name, either "MacNia" or "NiaFercar"). Current Location National Museum of Scotland [IB 183]. History Discovered in 1903, built into the inside wall of a barn, ¼ mile south of Latheron Post Office. Donated to the National Museum of Antiquities of Scotland in 1905. Description Part of a sandstone cross slab, with images of an osprey, fish and two horsemen beneath the cross, and an Ogham inscription on an artificial stemline running parallel to the left edge. The slab is broken at the bottom, and the entire upper part of the slab is missing. Dimensions 0.915 × 0.43 × 0.10 m.
Current Location Lost (last seen in 1971). History Found in 1920, as part of an 11th-century structure known as Thorfinn's Palace. Kept at the Department of the Environment in Edinburgh until it was lost some time between 1971 and 1996. Description Squarish slab, broken in two and cemented together, with an Ogham inscription along one edge. Dimensions 0.62 × 0.3 × 0.11 m.
Notes The inscription probably represents a single personal name. History Found on the beach some time prior to 1945; first discussed in print in 1962. Kept at the Department of the Environment in Edinburgh until it was lost some time between 1971 and 1996. Description Irregular-shaped slab with an Ogham inscription on its surface. Dimensions 0.37 × 0.24 × 0.05 m.
Notes The stone is weathered and water-worn, and only a fragment of a longer inscription survives. History Discovered in 1980 during archaeological excavations, where it had been used as a paving stone. Description Irregular slab of Stromness flagstone, with an Ogham inscription engraved on an artificial stemline along one side. Dimensions 0.31 × 0.35 × 0.06 m.
History Discoverd in 1870 during archaeological excavations. Donated to the National Museum of Antiquities of Scotland in 1871. Description Slate slab with a Celtic cross and part of a fish engraved on one face. An Ogham inscription on an artificial stemline is engraved to the side of the cross. Dimensions 0.7 × 0.39 × 0.05 m.
Ogham inscription is written with bind oghams, and includes some unusual Ogham letterforms, in particular the hashed double-R letter in the word "CERROCCS" that is not yet encoded in Unicode. The inscription has an X-shaped letter in two places. The first instance is written as an X-shape (ᚕ) and is normally read as a consonant 'K' (Allen & Anderson read it as a 'P'), whereas the second instance is written as a disjoined X (ᚕ) and has been universally read as a vowel 'E'. The reading of the same letter as both a vowel and a consonant troubles me. According to Forsyth and others the last word reads "CERROCCS", meaning cross (as a borrowing from Latin crux), but the 'E' is unexpected, and on other Ogham inscriptions the word is spelt "CRROSCC" (BREAY/1) and"CROSQC". This makes me suspect that the X-shaped letter (ᚕ) here represents 'K' rather 'E', and the word should be read "KRROCCS", with the 'C' going with the previous word ("KEVVC" ?). History Discovered in 1984 during archaeological excavations, where it had been used as an upright building slab. Description Broken slab with an Ogham inscription engraved on an artificial stemline across the surface of the stone. Dimensions 0.85 × 0.5 × 0.6 m.
History Found in 1852 or earlier when digging waste land near the old churchyard of St. Mary at Culbinsgarth. The stone was moved to the churchyard at Bressay; then taken to Newcastle; returned to Shetland; and finally donated to the National Museum of Antiquities of Scotland in 1864. 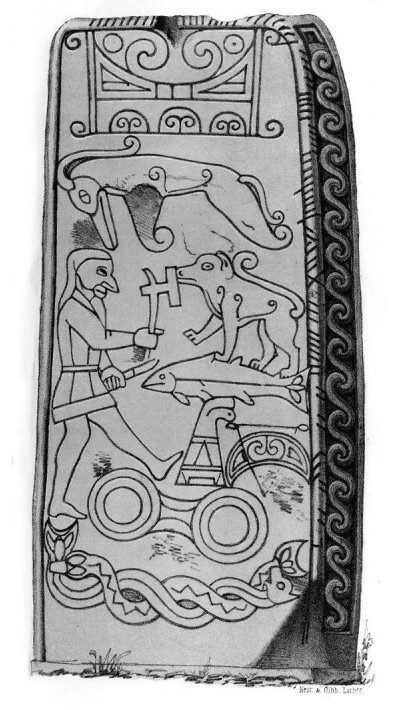 Description Schist cross slab decorated with Norse-style figures and animals on both sides, and with Ogham inscriptions on artificial stemlines running up both sides. Dimensions 1.15 × 0.4 × 0.05 m.
History Found in 1875 in the chapel graveyard. Description Irregular-shaped sandstone slab, a fragment of a larger monument, with part of a design in a square border on one side and a short fragment of an Ogham inscription on an artificial stemline on the other side. Dimensions 0.24 × 0.2 × 0.45 m.
Notes Ogham inscription is written with bind oghams. Forsyth's reading indicates a letter (H or D) between the I and the R that is not shown in Allen & Anderson's drawing shown below, and she also states that the two angular strokes are bound at the tips and the bind line extends beyond the second angled stroke. History Found in 1874 or 1875 in the chapel graveyard; donated to the National Museum of Antiquities of Scotland in 1883. Description Irregular-shaped sandstone slab, a fragment of a larger monument, with two fragments of an Ogham inscription, one along an edge of the stone and one on artificial stemline parallel to the edge. Dimensions 0.3 × 0.19 × 0.65 m.
Notes Forsyth suggests that the second line, "EHTECONMOR[S]", may represent Pictish ette-conmor-s "this is as great as" (cf. "ETTECUHETTS" ette-cuhett-s "this is far as" of LTING/1), where ette means "this is", conmor means "big", and s is an affixed demonstrative. On the other hand, "EHTE" is reminiscent of the supposed Pictish personal names "NEHTETRI" of ACKGL/1, "NEHHTV" of FRMSN/1, "NAHHTVVDDADDS" of BREAY/1, and "NEHHTON[N]" of LTING/1. History Found in 1903 when digging a grave in the chapel graveyard. Description Sandstone slab, a fragment of a larger monument, with three fragments of an Ogham inscription on artificial stemlines on one side. 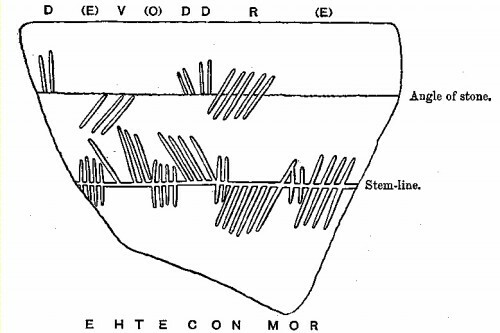 Dimensions 0.44 × 0.26 × 0.5 m.
Notes Forsyth suggests that the three surviving sections of Ogham inscription formed a single spiral-shaped inscription. History Found by Rev. J. C. Roger (who witnessed the discovery of STNIN/1 just one month earlier) in 1876, buried about 2 m beneath a peat bog; donated to the National Museum of Antiquities of Scotland in 1876. Description Sandstone slab with an Ogham inscription engraved on an artificial stemline on one surface, and a cross mark in one corner. Dimensions 1.12 × 0.33 × 0.04 m.
Notes Ogham inscription is written with bind oghams, and has several unusual letterforms, and double-dot punctuation marks. The personal names Ahehhttannn and Nehhtonn (cf. 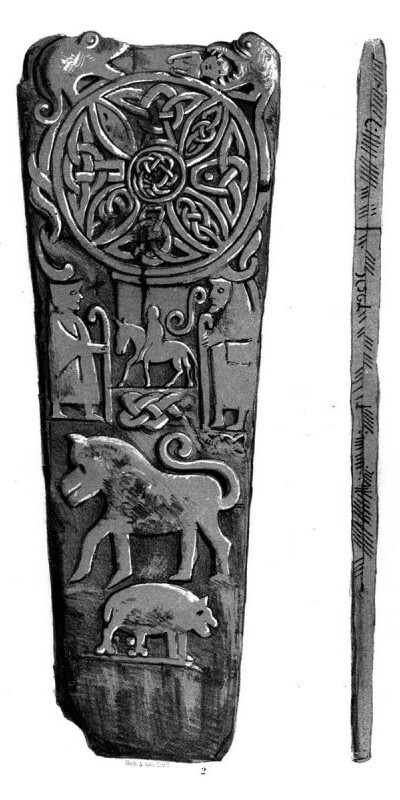 the common Pictish name Nechtan) have been identified in the inscription. History Found by Shetland antiquarian Gilbert Goudie in the sands at St. Ninian's Isle in 1876; donated to the National Museum of Antiquities of Scotland in 1877. Description Sandstone slab with an Ogham inscription on an artifical stemline along one of the sides. Dimensions 0.76 × 0.26 × 0.45 m.
Current Location Lost (last seen in 1878). History Found by Gilbert Goudie in the sands at St. Ninian's Isle in 1876, in the same location that he found STNIN/1. History Found in the churchyard of St. Ola's at Whiteness (date and circumstances unknown); donated to the National Museum of Antiquities of Scotland in 1946 or 1947. Description Sandstone slab, a fragment of a larger monument, with an interlaced knot design and an Ogham inscription on an artificial stemline on one side. Dimensions 0.18 × 0.22 × 0.07 m.
Notes Ogham inscription is written with bind oghams. Another fragment of the same stone, with more of the interlaced knot design (but no Ogham inscription), is held at the Shetland Museum (ARC 8057). This page makes use of the set of 12 BabelStone Ogham fonts, which provide a variety of different styles of Ogham lettering (stemline and stemless, bound and unbound, straight strokes and angled strokes). Web font (WOFF) versions should be automatically downloaded and applied to this page, but if you want to install these fonts on your local system they may be downloaded for free here. This would be another Scottish ogham wouldn't it? Yes indeed. Thank you for drawing it to my attention, I will add it the post shortly. The inscription on Lochgoilhead Stone (LOHED/1) above spells [H]OMO POILEA in both Latin alphabet and Ogham. It means "literary man" in Latin and may have something to do with the partial alphabet carved on the other side. Hope this helps! Dear M V Wexford, Thank you for the suggestion, which sounds plausible. Do you know whether this suggested reading has been published anywhere? Not that I am aware of. This is my own work. Missing the 'H' is consistent with other Ogham inscriptions in Latin, as in SDOGW/1 in Wales that you mention. 'P' is expressed using 'peith', a horizontal stroke under the stemline. The first 'O' is worn, 'L' is faint, but both are visible. I am a graduate student in IT and I do this as a hobby. Thank you for creating this page. If you would like to publish the HOMO POILEA reading please give me credit. 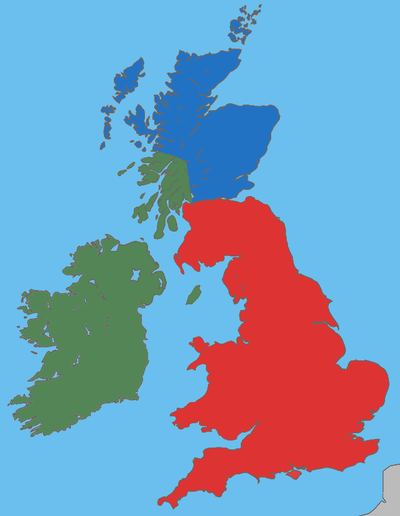 Scotland's a "region" is it? I could've sworn I live in a nation called Scotland! Hi pictishbeastie, thanks for the comment. I meant the term in a geographical rather than political sense, but I admit that it was a poor choice of words, and I have revised the post to remove the offending word.